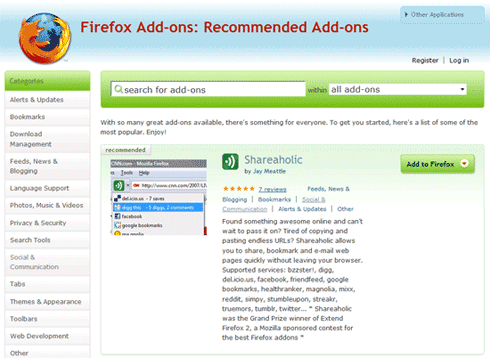 Mozilla has updated their featured add-ons list, and Shareaholic is now on the featured list on Mozilla’s official add-ons directory! Hoooraayy!! What does this mean for Shareaholic? More exposure, resulting in a bigger user & feedback community. According to Basil Hashem, the directory currently receives about 5 million pageviews per day with approximately 3% of the traffic to the recommended list. None of this would be possible without your support. A BIG BIG thank you to Mozilla, and our users for supporting, using, and believing in Shareaholic.